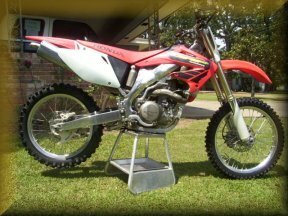 The KX is gone and a 2002 CRF has taken it's place in the stable. It truly is an awesome bike. 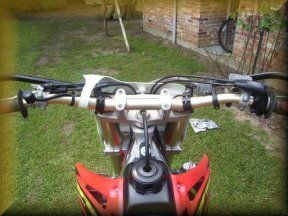 The first thing I had to do was install Flatland Racing radiator guards. The left side radiator was tweaked just a little when I bought it. 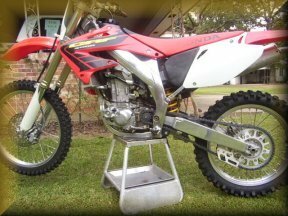 The bike stalls easily in tight stuff and sometimes just above idle on straight stuff. I have an EFM auto clutch on the way. It was running rich so I had to lower the needle two positions to get it right. I will be lowering the bike for my short legs. I sent the radiator to Myler's for repairs; they do great work and have a one day turnaround. The radiators now have Flatland Racing guards protecting them. I have installed an EFM auto clutch with Henson clutch basket which I love; great in tight woods. The bike has Answer Pro Taper bar cut down 1 3/4 inches. I have polished the frame, swing arm, and muffler. 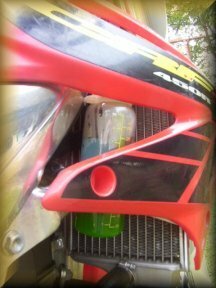 I have installed an overflow tank for the radiator; it is made from a baby bottle and zip tied to the frame.